You Deserve Representation and Security. We Focus on Results for U.S. Veterans Worldwide. Changes in Law Allow for Attorney Assistance. Changes in U.S. law allow you to hire an attorney for your appeal of VA benefits rulings. We are a VA-accredited attorney firm. Only those accredited by VA are permitted to represent Veterans in VA proceedings. We know how to get results. Contact us today for a FREE consultation. There's more! The Law Office of Robert B. Goss is committed to fighting injustice on behalf of individuals. Are you a Texas consumer? Are you a U.S. Veteran? Do you receive or provide health care? Are you an inventor or other creator of intellectual property? If so, our veterans' attorney is here to assist YOU. U.S. Veterans - Wherever you live, we can represent you! By e-mail, facsimile, or USPS, we ensure all required documents are sent to you. Likewise, you can send us C-Files, Service Records, Medical Records, and correspondence, allowing us to handle your VA claim or appeal no matter where you are. Contact us today for a FREE consultation. Consumers - Anyone who buys goods and services. You have rights against illegal landlord-tenant practices, protection from unfair debt collectors, foreclosures, employment pay issues and denial of unemployment claims, or Deceptive Trade Practice Act (DTPA) violations which "protect[s] consumers against false, misleading, and deceptive business practices, unconscionable actions, and breaches of warranty and to provide efficient and economical procedures to secure such protection." 1 The Law Office of Robert B. Goss works to protect those who face consumer injustices. Injustice to Veterans is widespread. Starting with active-duty personnel report errors to denial of Veteran Affairs (VA) Benefits and subsequent appeals of VA benefits denialS. Our veterans' lawyer focuses on Veteran Rights with expertise in all aspects of BVA appeals, CAVC appeals, correction of military records, VA disability rating appeals, and VA claims. Our firm can represent Veterans worldwide. You do not have to travel to or reside in Texas or Alabama. Representation is possible by receiving your service records, medical records, and VA claim file through the mail. Our medical professionals then begin to evaluate and prepare medical summaries of your disabilities. The Law Office of Robert B. Goss protects those who have protected us. Health Care issues affect all people at one time or another. Our Firm's Health Law Practice provides legal assistance with health care injustices such as patient rights, medical violations, violations of informed consent, Medicaid /Medicare fraud, doctor and hospital overcharges, and medical employment contract reviews or drafting. The Law Office of Robert B. Goss strives to protect those who face health care injustices. Intellectual property is just about anything you create with your mind. Intellectual property has no limits! It can be your website, the book or song you wrote, the jewelry you designed, the photographs you took, or a new hammer you created. Theft of your intellectual property is an injustice. Veterans' attorney Robert B. Goss can help you obtain the right protection for your intellectual property creations. Robert B. Goss Designated "Master Advocate" by the National Institute for Trial Advocacy An experienced trial advocate can assist you if your legal matter goes to court. 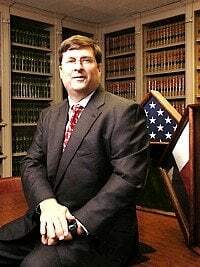 Robert B. Goss, founder of the Law Office of Robert B. Goss, P.C.